Interview: Dr. Hawa Abdi, Author Of 'Keeping Hope Alive,' And Dr. Deqo Mohomed More than 20 years ago, Dr. Hawa Abdi set out to change her broken society when she turned her 1,300-acre farmland outside Mogadishu into a camp for 90,000 internally displaced Somalis. Now she calls it Hawa Village — and it includes a hospital, school and farm. The collapse and rebirth of rebirth of Somalia have been a long battle, and women like Dr. Hawa Abdi have been on the front lines. Back in 1991, when the Somalian government collapsed, Abdi was a young doctor operating a small clinic on her farm with her family south of Mogadishu. As the conflict raged on, Abdi's clinic grew into a 400-bed hospital — and ultimately, a refugee camp. At the height of the war, 90,000 displaced Somalis made their home around Abdi's hospital. 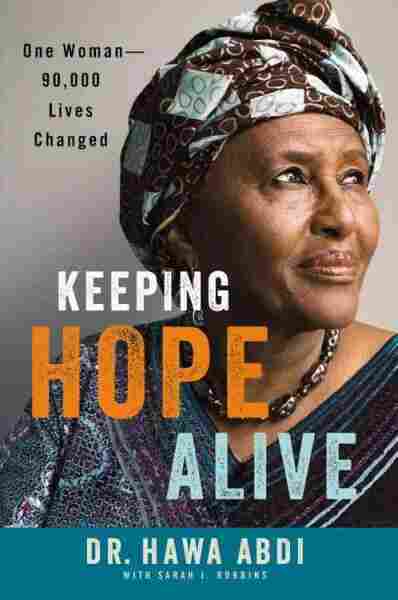 Abdi, who has been nicknamed "the Mother Teresa of Somalia," has a new memoir called Keeping Hope Alive: One Woman, 90,000 Lives Changed. As she told NPR's Audie Cornish, her camp and hospital — dubbed Hawa Village — became an island of peace she defended from militants, and an oasis she fought to maintain for people who had lost everything. "They are very angry and mentally not [there] when they are coming to you," Abdi says of the refugees. "Their parents or their brothers, their wives, their fathers were killed in front of them. They're coming to me. There is no government. The whole society became violent." How did Abdi keep the peace? With the help of the community of refugees that embraced her philosophy of equality above clan loyalty. Today, the camp and hospital are run by her daughter, Deqo Mohamed, who also became a doctor — she trained in both Russia and the United States. "The war has stopped in Somalia," Mohamed says, adding that for the past six months, she hasn't heard any gunshots at night. "You can sleep peacefully. And we're getting back to life in our village." Still, Mohamed's days are full: "At 6 [a.m.] we do the hospital rounds, inpatient, you know, I run all the errands in the hospital, and I do managing of the camp and farm and everything else from 7 to 10. Then 10 to noon I do take care of gynecology, because I'm the only female doctor now in the hospital. ... You do work 24 hours." Abdi says she is satisfied that her daughter is carrying on her legacy — but notes that at the height of the conflict in the early 1990s, her own days looked much different. "At night, each clan was going to another clan's people They were attacking — some people were dying," Abdi says. "Others were wounded. I was trying to give first aid, to talk with them, just mentally to comfort. ... Even seeing their face was very painful. That moment was very difficult for me." Because Abdi's camp took in refugees from clans that were at war with one another, Abdi kept the feuds at bay by forbidding any sort of clan allegiance. I want them to take part of society, to be part of society, not only in this village. ... It was good for temporary. Now you have to move on." "Necessity is mother of invention," Abdi says. "So when they come, we were informing them, if you use the clan division, or you say 'I am that clan,' you cannot stay here. You will be Somali. And you will see, we will welcome you." And, she says, the people she took in began to see how destructive those divisions were. Mohamed, who came to the U.S. as a refugee and studied medicine during the conflict, admits that there were moments when she didn't want to return to Somalia. But a sense of responsibility drew her back. "I was very passionate when I was in medical school [that] I need to do this in my country. ... When you're in school and you see the patient in the emergency room, they have every specialist, they have every equipment. And I wish we could have this thing in my country ... I went back because they needed me. Because I have to be there." A generation of young people has come of age in Hawa Village. Though the camp has been a place of refuge from a collapsed society, Mohamed says she's ready for its residents to move on — and rebuild what's fallen apart. "I want them to take part of society, to be part of society, not only in this village," she says. "My mom created a beautiful camp and village, but they're kind of isolated [from the] rest of the country. Because they get used to this peace and comfort, whenever they try to go out, they come back. Or they get 100 percent corrupted — we had young people, we lost them to the war and they become war soldiers. So for one hand, it's very difficult to move on. It was good for temporary. Now you have to move on."